Scottish born of Polish parents, raised in London and one of the last Ellis Island immigrants to the United States, Krystyna received her degree in Commercial Art from the Fashion Institute of Technology in New York City. Her early career in fashion design led her to the famous "New York garment district" where she successfully designed and distributed her "Miss Krys" clothing line of Teen Sportswear for Edy Winter Fashion Houses. Her career as an oil painter in Carmel-Monterey, California art scene where she turned to studio and Plein Air oils studying under noted portrait artist Jessy Corseau and seascape artist Harriett Mayland as well as other artists prominent on the Carmel art scene. Early recognition of her work as the Best New Artist in the Annual Carmel, CA Art Contest motivated her to turn Professional. Today, Krystyna works in all medias but it is her work in oils that comprises the majority of her work reflecting her rich and diversified life experiences throughout the United States and Europe. "My passion is in Oils where knife and brush combine with a rich color palette to give the richness of depth and light not achievable in other mediums. My subjects are as varied as her life--the old Missions and Southwestern scenes from California to Mexico, villages of Tuscany and Provence in Italy, and reflections of my Polish heritage. I paint Plein Air on location whenever possible and have a love for old fishing boats, the sea and ramshackle wharfs that first drew me to the canvas in Monterey." Krystyna's paintings are represented in many private, public and corporate collections world wide and are widely exhibited in juried shows throughout the Southwest. 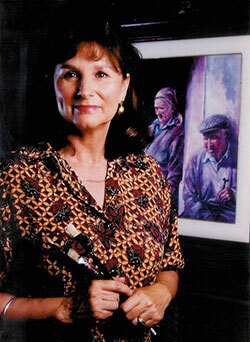 She has achieved a lifelong goal of recognition among her peers as an Associate Member of the Oil Painters of America (OPA and her work is notably represented in the International Association of the Visual Arts (IAVA) Museum of El Paso, Texas. Krystyna is a significant contributor to many Charities and Non-Profit Organizations and one of the Founders of the Plein Air Painters of El Paso and Past President of the El Paso Art Association. She conducts workshops in New Mexico, El Paso, California and Europe to help other artists follow in her footsteps. Click Here for her current schedule of Exhibits or here for her Workshops schedule.